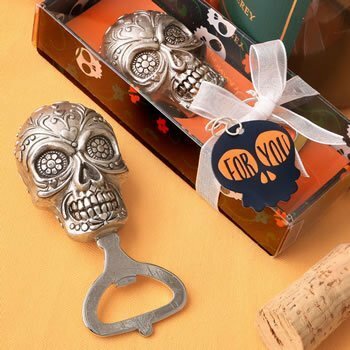 Wow your guests with Sugar Skull design bottle openers from our new Day of the Dead Collection. They will create the spooky ambiance you want for your party decor theme. The skull is crafted from poly resin in a detailed design and has a pewter finish. Attached to the poly resin top is a sturdy silver metal bottle opener. The bottle opener is packaged in a deluxe navy box with a sugar skull and floral design. The box has an inside stage in an orange color and the top of the box is clear for easy viewing. The box is wrapped with a white ribbon and bow. Attached to the bow is a sugar skull shaped 'For You' tag. This Gothic spooky skeleton design is both trendy and functional and will make a frightful favor for guests to take home!